Marley Dias. Photo: Andrea Cipriani Mecchi. 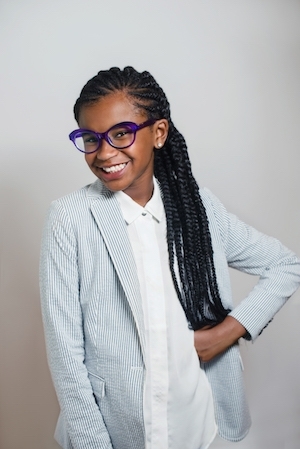 Pre-teen Marley Dias is publishing an activism guide for children and teenagers. The publisher, Scholastic, announced that the guide is set for release in Spring 2018. Dias is best known for her social activism movement, #1000BlackGirlBooks, which she launched in 2016. She was fed up with only reading about “white boys and dogs” in English class, and decided to start her own book drive. Dias’s goal for the book drive was to collect 1,000 books with black girls as the main characters. Her book drive soon went viral on social media and the drive collected more than 8,000 books thus far. Andrea Davis Pinkney, Vice President and Executive Editor of Scholastic, praised Dias’s “electric” energy. “Through her smarts and ingenuity, she’s delivered a jolt of inspiration that’s sent an unstoppable shock-wave to kids everywhere who’ve stood up with Marley to shout ‘Yes!’ to the power of positive action,” Pinkney said. The guide, for readers 10+, will discuss how kids can use their passion to capture the attention of the media and policy makers to affect change. In the “keep-it-real” guide, Dias will talk about her literary activism and the importance of literacy and diversity. The book will also explore activism, social justice, volunteerism and equity and inclusion. Frankly, all of Dias’s accomplishments (at twelve years old, no less!) are making me a little jealous, and wondering how I can ever catch up. With political upheaval all over the world, the activism guide will stand as a way to educate young people to speak out for what they believe in.